Lower Iveagh District Chapter takes in lower Iveagh and Lower Iveagh West Orange Districts. Our annual district service is held on the 2nd Sunday in September. 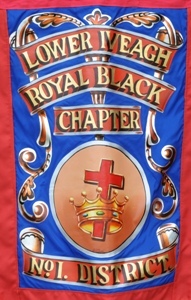 We have a number of Sir Knights who have held office in both County Chapter and Imperial Grand Black Chapter; Right Worshipful Sir Knight Raymond Adams who has held the post of ASGM and CGM. He is currently Imperial Grand Chaplain, County Grand Chaplain and District Chaplain. Sir Knight Colin Cunningham holds the position of CGM and District Registrar. The District Chapter meets on 1st Saturday in March, June and August and on the last Saturday in November at 7pm. With eight working Preceptories Lecale has a vibrant and active membership.William Johnston M.P. of Ballykilbeg was the first District Master of Lecale District and arguably the most famous. Nestling in the shadow of the Mournes Castlewellan District covers a large area including Dundrum and Newcastle where on Saturday 28th August 2010 the Sir Knights hosted the County Demonstration. Consists of 9 preceptories located across a wide area of the region including the City of Newry, the village of Bessbrook and the seaside town of Warrenpoint. 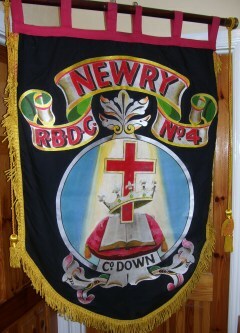 The Sir Knights of Newry Royal Black Chapter No.4 can certainly boast of an active and vigorous membership and played host to the County Down Grand Black Chapter Annual Demonstration in 2011. 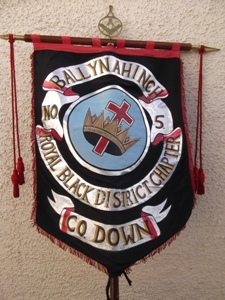 Ballynahinch District consists of nine Preceptories and covers an area from Carryduff to Seaforde and Kinallen. In 2010 the Sir Knights celebrated their centenary with a Special Service and Dinner. A jewel was also struck to mark the occassion. Banbridge District comprises ten Preceptories, bordering not only Lower Iveagh, Rathfriland and Newry but also the Districts of Tandragee and Lurgan from County Armagh. Banbridge is a prosperous market town which boasts Europe's first flyover known as 'The Cut' which was completed in 1834. The Sir Knights of the District have established many varied and interesting programmes including a monthly Evangelical Fellowship and numerous charitable and social events. 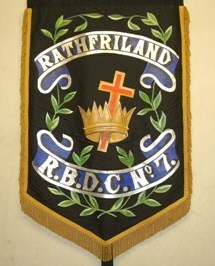 Rathfriland is a hilltop plantation of Ulster 'Settlement' situated between the Mourne Mountains, Slieve Croob and Banbridge. The District Chapter is comprised of eight Preceptories which meet in different locations throughout the area. 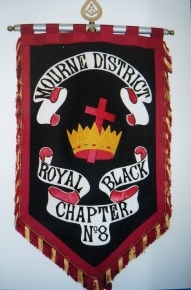 The most southerly of our District Chapters and located in one of the most scenic areas in the Province, Mourne District Chapter is home to the largest Preceptory in the world - RBP 208. 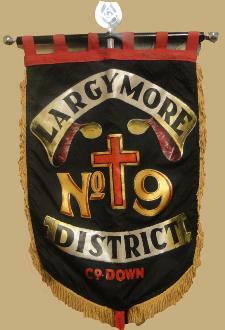 Largymore District Chapter was initially formed in 1878 with four Preceptories which had previously been part of Ballynahinch District Chapter No.5. Over the years the District continued to grow with the addition of several more and now with a total of thirteen Preceptories it is a strong vibrant organisation playing its full part in the work of, and also providing many leaders for, the County Grand Chapter. 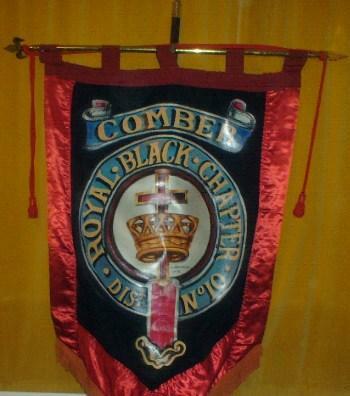 Comber District Chapter consists of nine Preceptories in and around the town of Comber which has long been associated with the growing of early potatoes and vegetables. It also had strong links to the linen industry, and ship building, and was home to the designer of the Titanic, Thomas Andrews. The square in the town centre is dominated by the statue of Sir Robert Rollo Gillespie who is reputed to have bellowed "One more shot for the honour of Down" when fighting in the British Campaign in India in the 1800's. 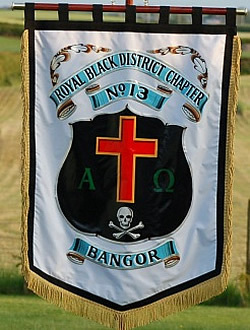 The Sir Knights of the District Chapter celebrated their centenary in 2006 with a special church service in Ballygowan attended by the then Sovereign Grand Master: Most Worshipful Sir Knight William Logan MBE. 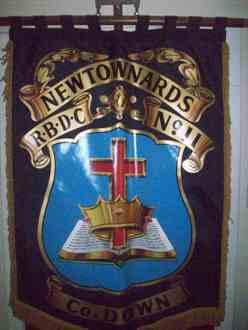 Newtownards District Chapter was formed by two Preceptories which had been affiliated to City of Belfast Grand Black Chapter. The District now consists of thirteen Preceptories which meet regularly at locations throughout North Down and the Ards Peninsula. 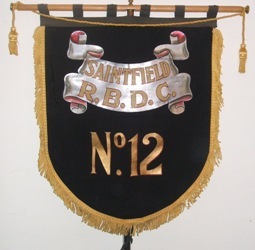 Based in the Historic town of Saintfield Co.Down were the Battle of Saintfield was fought on Saturday 9th June 1798. A short but bloody clash the battle was the first major conflict of the Irish rebellion of 1798. The District is made up of eight Preceptories and plays an active part within the County. 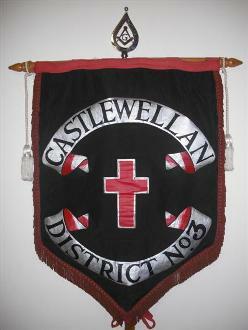 Saintfield District hosted the County Demonstration in 2005 in Saintfield when it celebrated its 60th anniversary. 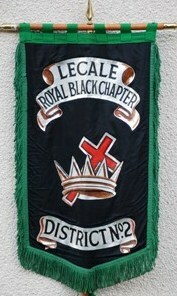 The smallest District and one of the most active in the County Chapter. 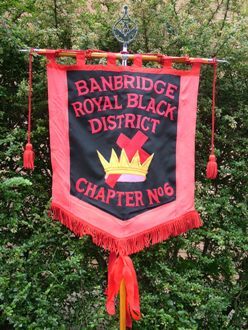 In 2006 the Sir Knights celebrated their Golden Jubilee with a Banquet held in the Crawfordsburn Country Club and in 2007 successfully hosted the Annual Demonstration of the County Down Grand Black Chapter at what was one of the largest Parades ever to be held in Bangor.